This report examines the current state of robotics technologies, organizes key issues and puts them in context, and succinctly explains how these technologies work. Research lab robot prototypes range from autonomous cars to the latest attempts at humanoids to artificial insects to lilliputians that measure less than a millimeter. The keys to making robots much more useful than today's commercial models are mobility and autonomy. These traits encompass many scientific and engineering challenges: practical dynamic balancing schemes for robots with legs, ways to manipulate objects without hurting them, more efficient power sources and power use, better sensors and better ways to interpret sensor data, more sophisticated navigation strategies, and coordination with other robots and with humans. The report includes an executive summary, a list of 21 developments to look for as these cutting-edge technologies take shape and a section of 32 researchers to watch, including links to their Web pages. It also includes a quick tour of 32 recent developments and a section of 27 in-depth news stories from TRN. The main report contains the following sections: Machines like us, Autonomy and utility, Getting around - walking, hopping, slithering and flying, Opening doors, Snakes, frogs and bugs, Buzzing around, Getting a grip, Source of strength, Do you see how I see?, Finding the way, Making decisions, All together now, Is it a he or a she?, Lilliputians, The shape of things to come, Coming home. The in-depth news stories are organized into the following categories: Mobility, Manipulation, Perception, Navigation, Decision-Making, Coordination, Human-Robot Interaction, Microrobots, Self-Building/Self-Shaping. 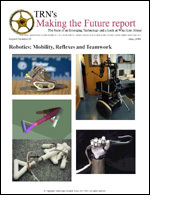 Buy the the Robotics report for $89.